A former key planning adviser to the Napthine Government has made an extraordinary attack on the East West Link project and the long-term strategy for Melbourne’s development. Professor Roz Hansen, who chaired the government’s Metropolitan Planning Strategy Ministerial Advisory Committee, last night told a city council meeting the planned road tunnel was a shortsighted and politically expedient option to solve the city’s transport woes. 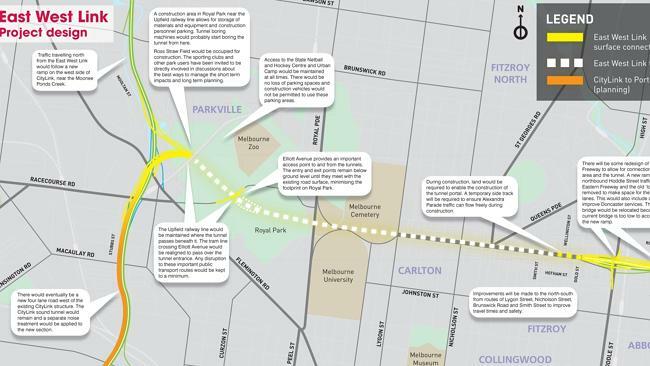 “This inner-urban freeway project will undermine, erode and destroy part of our Royal Park, being a special place of state and metropolitan significance as well as a signature feature of Melbourne’ renowned network of large parks and gardens,” she said. Prof Hansen continued her attack on the government that hired her by revealing that five of the six members of the metro planning advisory committee, including herself, resigned in August because they were unhappy with the direction of the Plan Melbourne strategy after changes were made to the committee’s draft document. Prof Hansen said public feedback during the consultation phase had indicated Melburnians favoured big improvements to public transport services rather than spending scarce resources on freeway projects. “In terms of the East West Link project at no stage was I, as the chair of that ministerial advisory committee, was I given the option of saying no, this is not the number one priority,” she said. The final Plan Melbourne document was launched by Premier Denis Napthine and Planning Minister Matthew Guy in October. Prof Hansen said the East West tunnel would permanently scar the inner urban landscape with Los Angeles-style flyovers, stark concrete viaducts and road canyons based on 1960s and 1970s transport solutions. “It is fraught with problems as well as showing a shortsighted and politically expedient approach, which I believe we as a generation will regret for a very long time,” she said. Mr Guy rejected Prof Hansen’s claim that advisory committee members had resigned, saying their role had ceased some time ago. He suggested that Prof Hansen’s outburst may have been linked to a financial issue. “I understand that members of the former advisory committee have spoken to my department about wanting more money and this wasn’t forthcoming,” he said. Mr Guy said he didn’t regret appointing Prof Hansen to the plum advisory role. “I think the vast majority of what she produced as the chairman of that group was good, was terrific, but that doesn’t mean I agree with everything she put forward,” he said. Now read page two – here’s how that Herald Sun article appeared online in a later version, with the same url. We added the bold italics so you’re sure about which bits have been amended, despite this newer version being somewhat shorter. Thanks for posting. It is great to see the close connections between the road lobby, the liberal Government and the Murdoch press exposed like this. Its a very personal attack to discredit the professor after her brave comments. Did these amendments come from the Minister’s office? Did the journalist have any say in the amendments?